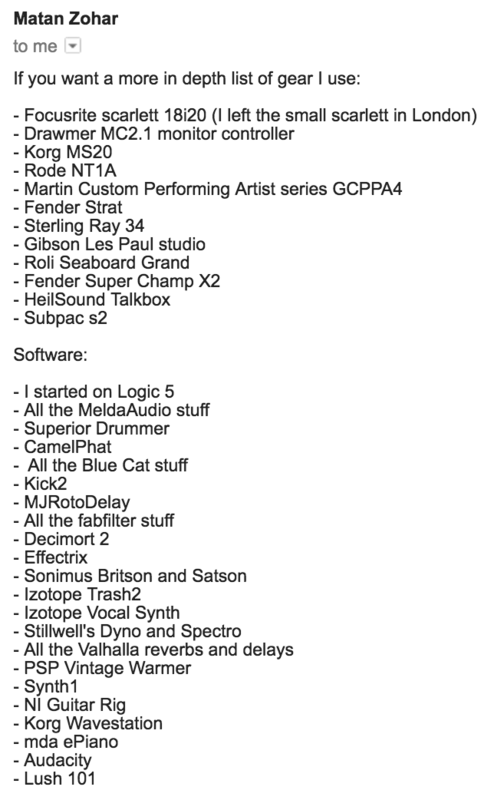 Mat Zo includes the PSP VintageWarmer in this Feb 2017 email where he lists the studio gear and plugins he uses. On the buss I’d start with the C1 Compressor from Waves. It’s really, really tight when you get it right. Then I’d put the Vintage Warmer on. "PSP vintage warmer and the bluetubes DR and the antares Tube are cool too for od fx." Au5 said on facebook: "Au5 production tip: PSP Vintage Warmer and Logic's Adaptive Limiter are far superior to any maximizer I've ever tried. Nothing has gotten this loud without killing transients or overdriving." After being asked: "Is all of your processing/production work done inside Ableton Live? ", he answered "There are a few third-party gizmos that I couldn't live without. The PSP Vintage Warmer is on everything; the SoundToys stuff goes well beyond anything you'd expect from a delay unit - it almost has a voice of its own; and CamelPhat is a versatile combined filter and overdrive - a very creative tool." At 05:36 min a VST PlugIn named "PSP Vintag..." can be seen. In this video you can see Tom Staar using PSP VintageWarmer at 14:09s. This plugin can be seen at 8:49 in this video. "I've downloaded it like 2 years ago or something and just never stop using it". At 32:36 you can see that the plugin is on the master. "I use it on nearly everything! Perhaps too often but it shapes sound so wonderfully!"